Rubber Room Ramblings: I FINALLY GOT TO PLAY! At long last I have managed to fit some stamping into my schedule! 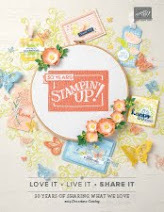 This is a card we will be making at my Holiday Stamp-A-Stack on July 28th. 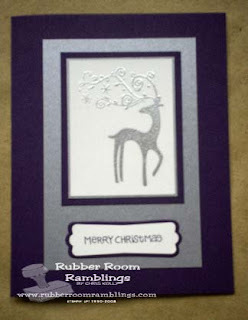 I stamped the image from the Dasher with my Silver Encore pad and then embossed it with Silver Embossing Powder. Then I layered my image onto some Brushed Silver Card Stock. For the sentiment I markered the words from the Punch Pals stamp set and stamped them in Elegant Eggplant on Whisper White Card Stock and then used my new Modern Label Punch to punch the words out. I used my Movers and Shakers Big Shot Die to cut the shape of the Modern Label Punch a little larger than my punch and mounted my sentiment on that piece of Elegant Eggplant Card Stock. I love the elegant look the Brushed Silver Card Stock and embossing gives this card!